Iku is a wholefoods cafe in the inner-city Sydney suburb of Glebe, started by the British-born macrobiotic chef, Holly Davis, in 1985. Over the years, Iku has expanded into other suburbs but going into the original Glebe cafe with its simple wooden stools and eating benches is like stepping back in time to the macrobiotic food craze of the 1980s and 1990s. When I was pregnant with my son, I was addicted to their tofu rice burgers, deep fried rice balls and their sweet sago and black rice puddings. The day we took my son home from the hospital, we stopped by Iku to pick up takeaway for our first meal to eat back at home. I’m not really a wholefoods fanatic but there are times when a bowl of brown rice is the only thing I really want to eat. When my son was six months old, he came down with a pneumococcal infection and I spent nearly a week with him at Westmead Children’s Hospital. Staying at a hospital when you’re not ill is a surreal experience. After the intravenous antibiotics kicked in, my son really wasn’t that sick either, so I spent most of the day walking him round the hospital corridors in his stroller and getting to know every shop and food outlet in Westmead Hospital. Along with breast milk, my son also received bizarre looking trays of baby hospital food, with artistic blobs of individually pureed veggies and fruit, but I had to forage for my own tucker. I would have breakfast in the dingy, underground hospital cafeteria and, for lunch, eat a takeaway cheese and salad sandwich in one of the hospital courtyards. The gourmet highlight of my day was a coffee and a friand from Starbucks. Then, in the evening, my partner would drive over from the inner west and bring takeaway food from Iku for dinner. After a day confined in hospital megatropolis, Iku food was like a breath of fresh air from the world outside: it tasted unbelievably wholesome and good. 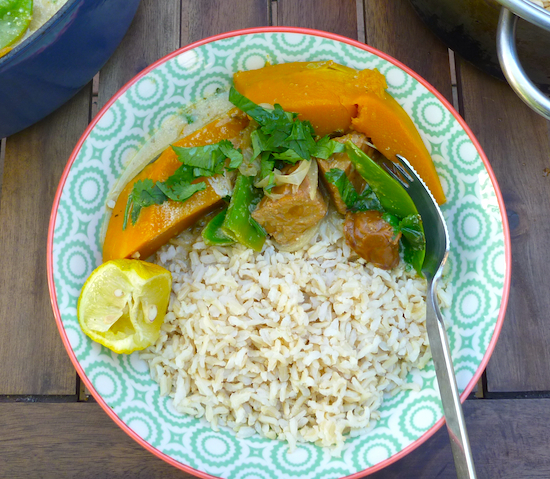 This tempeh and pumpkin curry is from the Holly Davis cookbook, Nourish, and typifies her style of food. 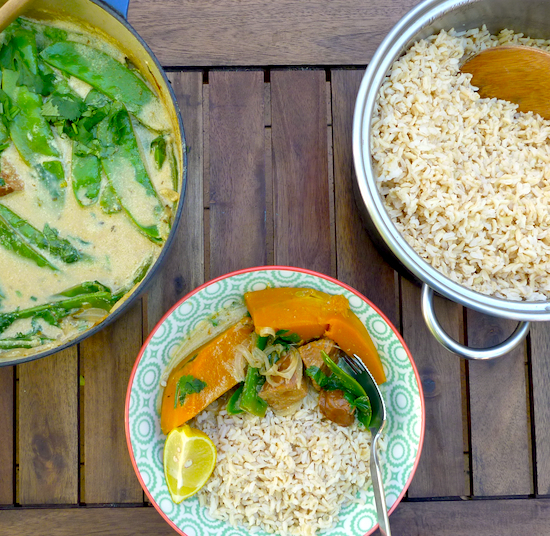 It has none of the intense spiciness of an authentic Thai curry but there are times when the mellow, wholesomeness of this type of curry, served with brown rice (of course), can become the ultimate comfort food. 2 lemons or limes cut into generous wedges. Heat oil for deep frying, and fry tempeh until golden brown, drain well. Heat three tablespoons of oil in a large pan. Saute onions until they begin to brown, add coriander root and saute for another five minutes. Gently toss pumpkin in pan and coat with onion. Add curry paste and cook for a further five minutes stirring often. Add tamarind paste, coconut milk, stock, palm sugar, kaffir lime leaves and tempeh and simmer uncovered until pumpkin is almost tender. Add beans, choy sum stems or snow peas and simmer to thicken sauce. Garnish generously with chopped coriander. 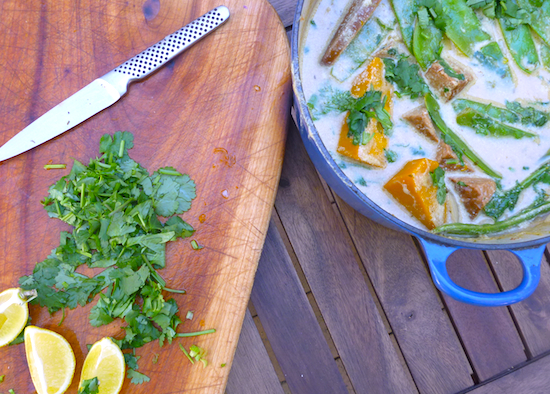 Serve with rice noodle, brown or white rice and lemon wedges. I sometimes use deep fried tofu in this curry as well. It may be its macrobiotic roots but this curry does remind me of those mellow Japanese curries that aren’t too spicy. happy dancing to have discovered your blog 🙂 This curry looks amazing. I love pumpkin. Thanks look forward to further visits. Love this, Elizabeth another beautiful recipe! For reasons I’m not quite sure of, I very rarely cook with tempeh but this is most definitely making me rethink that! Pumpkin is one of my favourite foods & this looks especially delish! I love tempeh, but it’s hard to get really good tempeh in Sydney. In Victoria ‘Primasoy’ make great tempeh in Mulgrave it should be relatively easy for you to buy. I highly recommend it.